The ITUC has condemned the murder of Turkish trade union leader Abdullah Karacan, and the wounding of two other union representatives in Adapazari, Turkey, today. According to reports received by the ITUC, a gun-wielding assassin fired at the union officials while they were meeting workers at a Goodyear tyre factory. 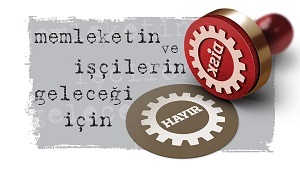 Karacan was president of the rubber and chemical workers’ union Lastik-İş. The union’s regional president Mustafa Sipahi, and shop steward Osman Bayraktar, were also shot. Bayraktar remains in a critical condition. “This is a devastating attack, and our condolences and thoughts are with the family of Abdullah Karacan and those who were wounded during the attack, as well as with the workers who witnessed the shooting. We call on the Turkish authorities to ensure a thorough investigation and bring all those involved in this atrocity to justice,” said ITUC General Secretary Sharan Burrow. A highly respected union leader, Karacan managed to win a significant victory against precarious work by persuading multinational tyre companies to end outsourcing at their operations in Turkey. Lastik-İş is a member union of the ITUC affiliate DİSK and of Global Union Federation IndustriALL, which has also expressed shock at the attack.